Senyorita Lakwachera: Summer Adventure at Sandbox Alviera. Summer Adventure at Sandbox Alviera. 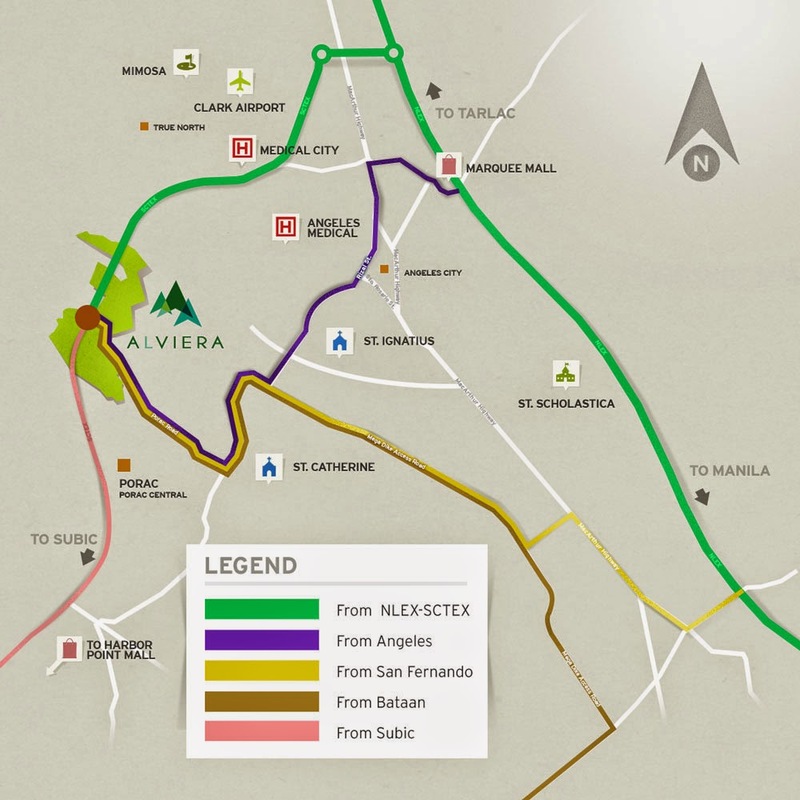 Last week in the midst of my busy schedule, I got a very tempting invite for an advance preview of a newly built Adventure Park inside the 1,125-hectare property of Alviera in Porac Pampanga called Sandbox. I am quite fond of safety adventures but I rarely attend to media events specially this far, this time was different though, my curiosity on their published amenities really won. I personally thought that I could try the giant swing, so I immediately confirmed my participation together with my two companions. Saturday, after our graveyard shift we went straight to Trinoma Mall where the service van provided by the organizer was located. The trip took us about an hour and half to reach the venue. Tired of the trip after shift, we first freshen up and had our breakfast to make sure that we have the energy enough for our chosen activities. The first thing we would like to try is the Aerial walk which we didn’t pursue due to the long queue and considering that it might take forever for us to finish the challenge as it gets tougher and tougher. Then the giant swing (first in the Philippines, about 10 meters high), this was really the reason I went here; this made me so curious about how my childhood swing twisted into an ultimate adventure. My heart beats faster and faster as I get closer to my turn. Again – I haven’t had a ride such as this one before, but my cousin who’s with me already been to a few adventure rides like Vikings. I would like to thank her for encouraging me that it is okay and we can do it. To experience this, you will have a choice to have the single ride, but of course I wouldn’t want to be alone in this adrenaline pumping challenge so we choose to go as a couple. The rope started to lift us to as high as the first frame and we started screaming as we get further and further from the ground and started to feel the height. A second’s pause and the clip were released and we plunge down fast. I literally felt numb and the unexplainable thrill of falling. The feeling mended for a few seconds as we passes the bottom but it immediately went back as the swing soars us high again and drop back. Definitely an experience that up to now I can’t imagine I survived. After that, I already felt quite satisfied but of course we want to make the most out of the invite, so we proceeded to try the ATV and UTV ride. The temperature is so high, it's screaming that it;s already summer, yet my two companions can’t get enough of this ride so I had to go with them. There were two UTV available that time and my cousin and Jac went fast to get them, I said I’m taking the ATV since it is more thrilling for me. I was informed that it would be harder to drive and the facilitator suggested that I could take the next available UTV but I insisted. Before departing, while the facilitator are giving instructions and briefing, few minutes under the scorching heat of the sun I suddenly felt tired and uncomfortable. Maybe it’s because I haven’t had a good sleep yet for the past two days and the super-hot weather. For my own safety I decided to take a ride in the UTV with Jac, she is the one who drove and I just enjoyed my seat feeling like a real senyorita touring around my greensward (hehe). Then after we take a look at the other activities such as Avatar One Roller Coaster Zipline (first in the Philippines), 15 meters high Adventure Tower where you can enjoy wall climbing and free falling, pump track, Play Ground with Picnic Benches and more. Amenities will all be ready for adventure junkies, outdoor hobbyist, and families’ amusement on their grand opening this April 12, 2014 with a concert featuring Bamboo Mañalac. This day is truly an exciting experience, my company and I had a great time at Sandbox Alviera and would definitely recommend it for a group getaway and team buildings. Given more time I would try to finish the aerial walk and experience driving the UTV. That goes my summer adventure for now, will have more in a few days! 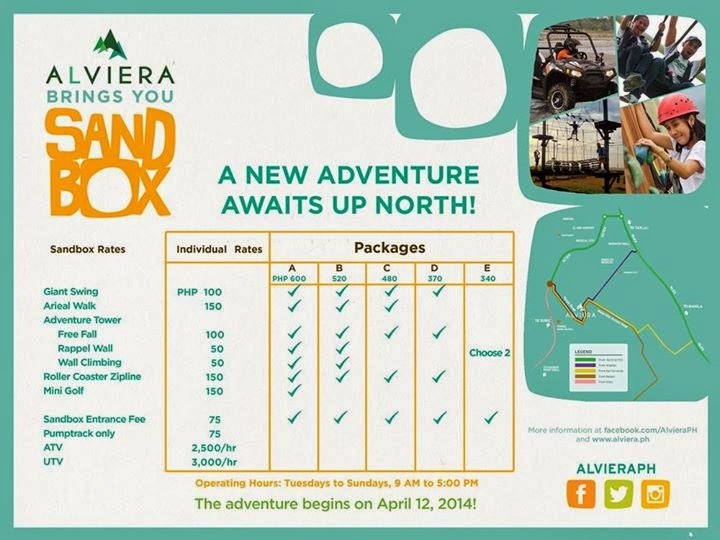 For more information about Sandbox at Alviera visit their website and check their FB Page. Wow, it was an ultimate adventure. Holy fucks I think my heart stopped with that clip of the giant swing. I can't imagine myself doing somersault in the air like that. But I think I wanna give it a try. Been there too last year with friends. That moment when the Giant Swing's in-house photography provider captured the most awkward of the moment. These snaps will never be Facebook-worthy. Ever. Hahaha. We try all the activities and it's worth it especially the atv. Thanks for the Info and pics. We will try this too with my GF. We have no car to go there. What possibly ride can we get to visit this site ? Is there's a bus going to this location?